The above Semifinal Matchups would arguably be the best matchups with the best 4 teams in the country at THIS TIME. Georgia could easily be added to this mix. But should Notre Dame? Yes, Notre Dame. This may not be the best playoff situation, but the bottom line is that Notre Dame was one of three undefeated Big Majors and OSU lost significantly to Purdue. Unfortunately, for the fans, this most likely won’t be the best teams or matchups. 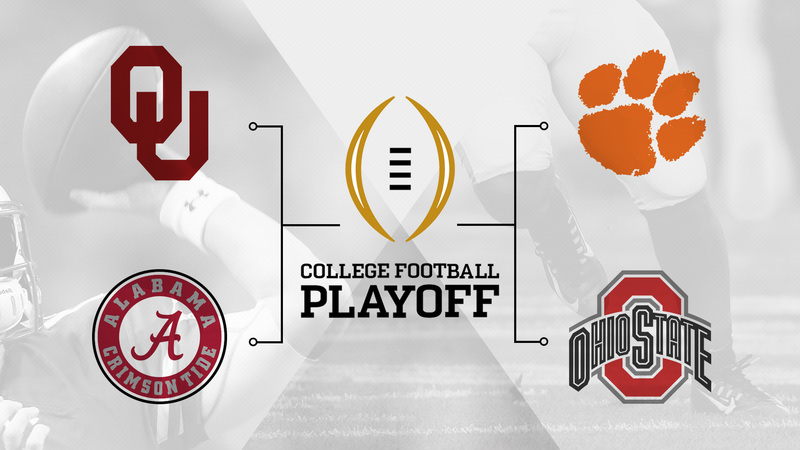 OSU had as much a chance to be in the NC as any of the other 5 playoff contenders. They were definitely one of the 4 best teams by the end of the year and here’s my thoughts. Urban Meyer finally evolved his PS Offense to a more modern version- something he’s been attempting to do since Tom Herman left as his OC. OSU also has, by far, their best passing QB in their history in Dwayne Haskins. But this was not about conforming the offense to a “pro-style” QB. It was about finding more Variety – more Spread to set up more Power – in Urban’s power oriented Power Spread. He struggled in his relationship with Tim Beck after Heman left, but he finally struck up a good rapport with Ryan Day helped by his old PS mentor Kevin Wilson. There was a lot of change at OSU during this offseason and it wasn’t just about the off the field activities that garnered so much attention. The shift to Ryan Day as the main Offensive mind to help evolve Urban’s Power Spread was huge. Ironically the Offense was better with Meyer on the sidelines serving a suspension. But after the Purdue game the offensive coaches braincstormed and enlisted the help of a wide variety of sources to finally come up with something that worked. More Spread leading to more Power. More variety overall leading to a more evolved PS Offense that would enable a lot of QBs to flourish – not just the great Haskins. But with that being said, Haskins is a talent that would make any offense better. This evolved scheme from one of the PS Originators in Meyer combined with the great arm of Haskins would have made OSU a tough out for anyone – including Bama! As for a matchup with Clemson – as great as Brent Venables is as a DC and even with the talent on his Defense – OSU would score points. I don’t believe any D can stop them at this point in Time. Similar to the Offense, OSU went thru a big off-season change on their Defense adding in a top notch young DC in Alex Grinch. They also lost a lot of players to graduation and then their best player Bosa went out for the year with an injury. Changing schemes, inexperince and a huge injury was a lot to overcome. Now some say that OSU’s Defense is too poor to keep up with any of the best teams, but this I don’t believe. OSU’s DC Greg Schiano along with Grinch worked hard to update the scheme by adding more Aggressive Variety. Throughout the year there was a lot of mis-communication creating a lot of big chunk plays that really hurt the team. Especially because the D wasn’t creating the big plays in return to even out the positive/negative ratio. BUT….. the defense has improved of late. They still mis-communicate and give up big plays, but the difference is there are less of those negative plays and they are now making just as many or more big plays for their side! And though OSU is lacking in experience while making changes in scheme, there is a lot of talent that was finally starting to show at the end of the year. In my opinion, OSU recruiting classes are at an all time high. And that’s saying something with some great recruiters past like John Cooper and Jim Tressel. At this point I would say OSU is in the running for the second most talented team in college along with Clemson after Alabama. So could OSU beat Bama or Clemson? At this point in time I would expect Clemson and Alabama to rack up some yards and points for sure, but big plays for the OSU Defense at crucial times may have also occurred. Especially with the opponent feeling the pressure to keep up with the “on fire” OSU Offense. Again, Notre Dame earned their right on the field by winning all of their games. I have spoken with some ND fans who swear their Schedule was a tough one. These fans will provide stats and other details to skew the argument, but I go by what I see on the field. What I have seen on the field did not impress me as much as what I saw from the other 5 teams in consideration for the Playoffs. I will say this for Notre Dame – Brian Kelly continues to evolve his Offense, Defense and Talent and this may be his best team ever. But is it enough? I like his latest choice for OC in Chip Long who has somewhat of an Air Raid background. This should mean more Spread, but actually that’s only half the equation. It also means more Power because Long also has a Pro Style background and does a nice job of mixing the Air Raid + Pro styles into a unified whole. Now, I will not call it a PSAR (Power Spread Air Raid) scheme, because it is more balanced than that. There’s a real mix of power run sets with spread passing sets. This keeps the field effectively larger than it is and opens all the holes for power and ball control if Kelly so determines he needs. That last statement is the problem I have with what Kelly has progressed to … or regressed to this year. Yes it was a big year for ND and they were undefeated, but in some ways they have gone philosophically backwards offensively. The change of QB looks like a huge plus to everyone in Football Land, but in reality it has produced a more conservative mindset. Ian Book does a lot of things right, can hit the deep pass and even run a little bit. This is all good. What’s not good is what I hear Kelly say when asked about his change to Book as his QB this year. He is all about the ball control, which in turn helps his defense. This is not Power Spread Aggression and will not work against the top notch defenses. Brian Kelly is one of those Power Spread originators just like Urban Meyer, but like Meyer he has also struggled in evolving his ideas. Notre Dame won IN SPITE of their Offense more than because of their Offense this year. I do not think they will be able to do much against the great DScheme and talent of Clemson let alone Bama. Now the good news for ND and for me THE reason they are undefeated and in these playoffs. Their Defense run by first year DC Clark Lea. Now the question is, “How did a first year no-name DC do such a great job at ND this year??”. First off, Lea is a protege of Mike Elko who is well known for his tricky 4-2 Defense and was with ND the year before. The transition was not only seamless, but even better as Lea added more aggression to Elko’s sneaky coverage mixes. So where did Lea get his aggressive nature? It definitely wasn’t in his early years where he had rather conservative 4-3 mentors. My guess is his experience under Scott Shafer at Syracuse effected his philosophy in a big way. Shafer is the unknown that helped create “Quarters” Defense that is always attributed to Pat Narduzzi. Shafer worked with Narduzzi to create this concept and scheme. He also can be very aggressive with his blitz packages like Narduzzi. This year Lea has combined the mixed coverages of Elko’s 4-2/3-3 with the zone blitzes of Shafer/Narduzzi into a nice package. It’s not at the level of the very best like ND will be going up against versus Alabama and Clemson, but it’s where Schiano was trying to go with OSU’s Defense this year. Still not enough variety, but just enough that will work with solid execution and some talent. An easy schedule doesn’t hurt either. This is where I will leave off – Schedule. While the stats may not show it and fans will argue it- ND had an easy schedule compared to OSU. I will admit that the Big 10 has been behind the PS Evolution for a long time, it is not anymore. There are great PS coaches throughout the league now and regardless of the records, teams like Purdue, Nebraska and Minnesota are on the rise and can be a handful on their best days. Which they all had versus OSU this year. There is some argument, I will admit, for ND’s schedule being overlooked. Syracuse had a big year. Michigan as well. I actually watched Syracuse live and took another look recently at the Michigan game and again – I WAS NOT IMPRESSED. This was not the best quality football of the year. Michigan actually played better after that game and Syracuse just had a bad day. VTech, Stanford, FSU, USC and Pitt really weren’t that good this year – lets be honest. At least that’s my view from what I saw ON THE FIELD. Not in statistics. Notre Dame deserves to be in the playoffs. Their schedule was tough enough and they were undefeated. I have to accept this fact. But the best playoffs this year included OSU, not Notre Dame. In quality of play at this time of the year. That I do believe. Notre Dame has a chance to prove me wrong. OSU won’t get that same chance to prove me right.